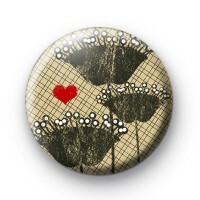 This 1-inch button badge has three on a beige patterned background and also a little red love heart. Its a pretty floral design and would make a nice handmade gift. Unlike a bunch of flowers, this floral badge will last a very long time and look super cute pinned to your coat or bag.